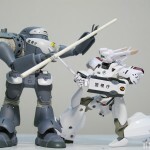 If you’ve been following CM’s Corporation’s Patlabor sofubi releases, you should be familiar with the drill by now â€“ ‘Same scale’ as the main Brave Gohkin figures (approx. 1/46) with ample detail but limited articulation. And of course a limited run: MPL96 blue TV ver. (700pcs); MPL96 white OVA ver. (500pcs); SSL96 standard ver. (300pcs). In my case, I opted for the ‘standard’ and ‘TV’ versions because I’d already invested a small fortune to recreate the TV-edition Ingram team. 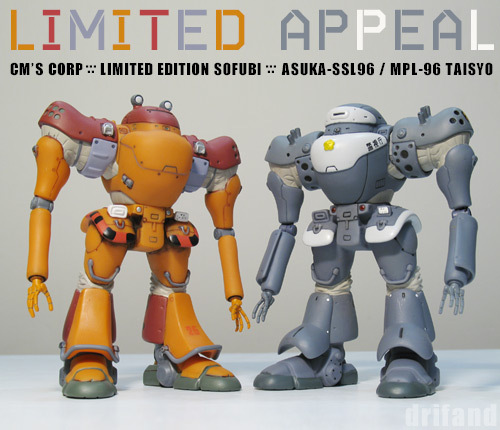 ‘Official history’ tells us that the MPL96 Taisyo was the Mobile Police’s first operational labor, hastily adapted from the Asuka-SSL96 Taisyo, an existing construction model. 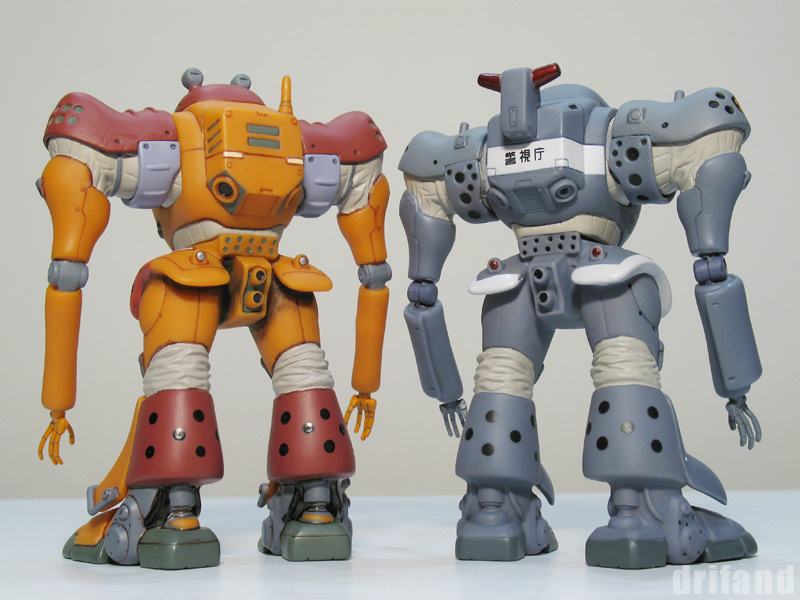 The front view shows the obvious similarities, but at the same time, I was pleased to see that CM’s used quite a number of different parts to create the two models; the only common parts are part of the upper arms and most of the lower body and legs. The shoulders are different molds, as are the upper bodies, forearms and shins. From the back, you can appreciate the details even more. The MPL in particular has quite a bit of tampo printing for the SV2 emblem, as well as the tiny ‘license plate’ on the left hip. The ‘frog eyes’ on the SSL96 are very kawaii, and the only quibble I had was the painted-on ‘holes’ on the calves. I mean, they DID mold the holes on the shoulders… Otherwise, that’s it. They look nice on the shelves but they do absolutely NOTHING ELSE. 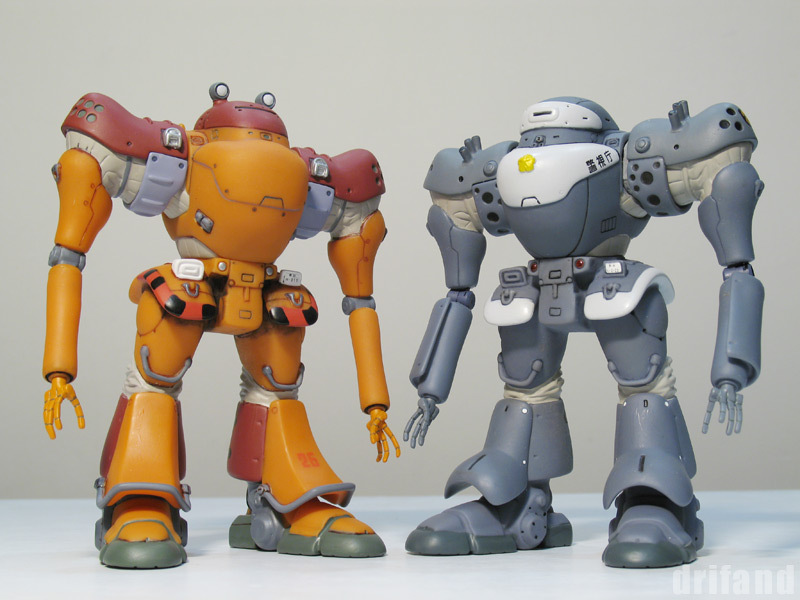 Sure, they’ve got a waist joint but seriously, I was expecting the arms to at least rotate at the shoulders! As the ‘worker’ Taisyo is going to be a pretty rare find in days to come, I decided to leave it be in the company of the other laborers. Now the MPL96 is a whole ‘nother matter to me. 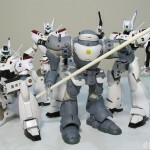 No way could I be satisfied with a ‘Patlabor’ that couldn’t even look like it’s going to arrest a wayward labor. So after a quick examination, I took the plunge and did some surgery to it… and Voila! My MPL96 is now able to carry a battle staff for riot duty. To begin, I detached both shoulders, carefully prising them away from the body. As expected, the parts are assembled with ‘superglue’, so you will need a tool like a flat screwdriver, and quite a bit of force. Once taken apart, I noticed that the original mold had already included a convenient circular depression right where a joint would go. I pierced it and shoved a spare ballpoint pen shaft through to serve as a simple ‘axel’. Do note that the bit of extra ‘shroud’ hugging the bottom of the hollows are in fact originally part of the shoulders, cut-off and re-attached here. One of the tricky things about customising sofubi is that the casting is never exactly the same for each figure, and even less consistent from one hollow part to another. Just look at the shoulder cavities for example: The one on the right has plenty of excess PVC around the joint, so that even after slicing the ‘shroud’ to create a rounder cross-section (for easier turning), the joint is still pretty solid. However, the one on the left is a lot more ‘airy’; while slicing the shroud, I managed to cut into the hollow and had to patch it back with putty. 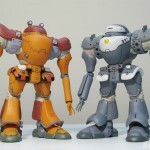 Lastly, I cut apart the arms at the elbows and inserted a custom joint using Kotobukiya’s M.S.G. (Modeling Support Goods – rolleyes) ‘Poly Unit Double Joint D-113B‘. Although the part is a double joint, I simply left out the mid-section to create a ‘single joint’. I also had to carve out a bit of the forearm’s attachment point to accept the thicker pegs, but ultimately it was a pretty simple job. I couldn’t do anything about the wimpy hands, but if you twist them in just the right angle, they CAN exert enough grip to handle a 6.5″ length of plastic rod. Even as a kid I could tell that most Clover toys ‘sucked’ when compared to the better efforts of Takara, Popy and Takatoku. Dunbine? Insect! 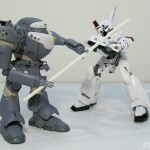 Gundam? Shiny nonsense! Xabungle? 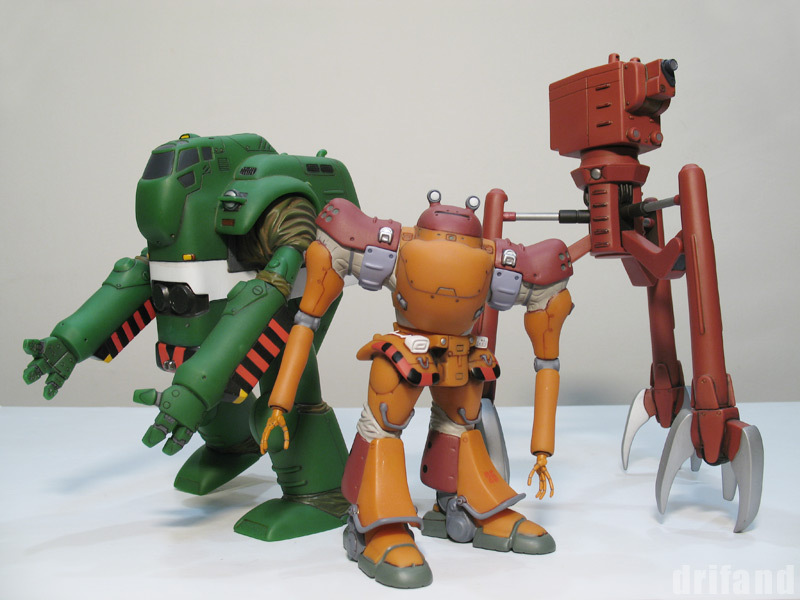 Hmm… No matter their shortcomings, Yoshiyuki Takani‘s oil painted box art definitely resonated well with Xabungle’s trio of realistically designed mecha; and the most desirable, of course, was Irongear… not that I could afford to have one then. Well, I finally got my hands on a Henkei DX Irongear (See Matt’s original Rumble from ’02) around ’99-’00. It may have been practically all-plastic, but the toy was true to the romantic notion of massive ‘landships’ that bristled with armaments and ‘sailed’ the desert with impunity. The tiny afterthought of Xabungle on the box art, dwarfed by this Mother-of-all-Landships added immensely to the sense of scale and drama. For a Clover toy, it was darn close to perfect: Painless transformation, elevating cannons everywhere, nice molded details and even gimmick compartments. 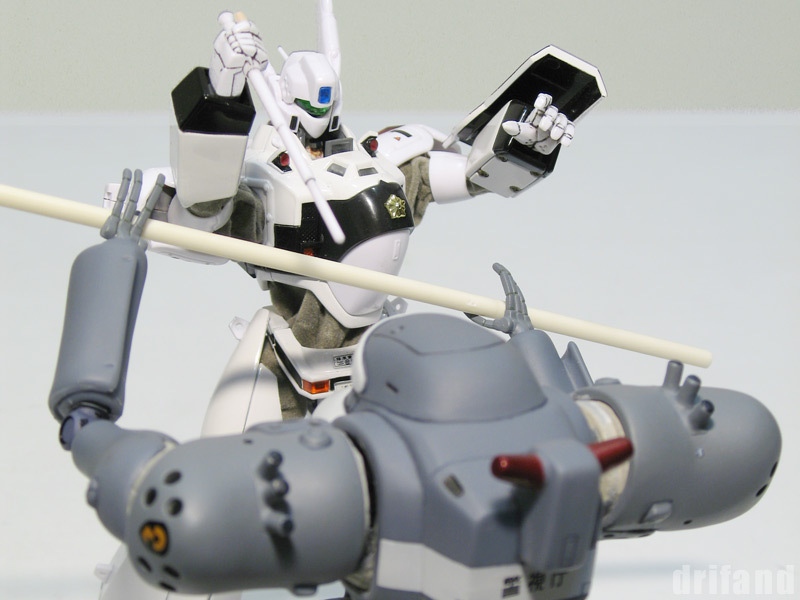 Despite the senseless need to detach the fists, the Henkei DX was absolutely satisfying as a true toy experience. You could lift it in one hand to fly it into battle, or roll it on the metal wheels concealed under the split-halves of its legs. So what has the SOC to offer that the Clover doesn’t? In a word: Articulation. The older toy was obviously a brick, and not having watched the show, I could even convince myself that the actual design never ‘walked’. Boy, was I wrong! The hobby mag photos had already revealed most of the gimmicks, but I was still pleasantly surpised by the heft of the package. SOC Irongear packs serious steel in key areas such as the chest, groin, thighs, rear lower legs and connecting hinge. However, the real ouerve by Bandai’s team of toy engineers is in giving back to Irongear the magic of poseability: There are no less than 19 points of articulation on the SOC, including firm detented joints in the hips and knees. No doubt about it, the SOC’s bow section looks nicer than the Clover’s. From the independently elevating main cannons to the detailed bulkheads, the SOC impressess with its gritty realism. My first surprise: the rotation of the SOC’s bow tips are synchronised as they are joined by a peg between the halves. Clover’s saving grace are the spring-loaded launchers for the mini-vehicles. The SOC’s forward section sports even more molded detail in the form of rivets, grills and 2 x 4 opening panels that reveal the mechanical guts of Irongear, ala PG Gundam kits. The Clover isn’t too shabby, but relies more on stickers to add visual contrast. An interesting note: the two midship gun emplacements are fixed on the SOC, but are free to rotate on the Clover. 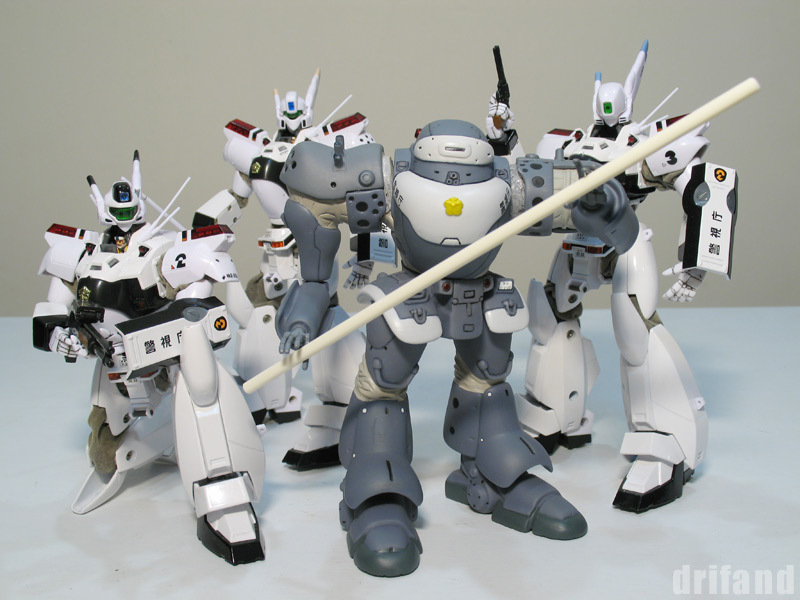 Bandai is probably more ‘accurate’ but I prefer Clover’s tactical embellishment. The Clover’s mid roundel is a sturdy affair held together by two pegs on both extending sides. It is only slightly marred by the patch of light gray from the rear half of the thighs. Bandai managed to achieve perfect homogenity and even included a pop-up ‘Potan Cannon’ on the left side of the roundel. Owners of the Clover should take care to read the SOC’s instructions BEFORE transferring the torso / bridge to the aft section. It requires an extra step of separating the rear legs in order to insert the 2-part metal hinge, unlike the simpler (but limited) mechanism of the Clover. 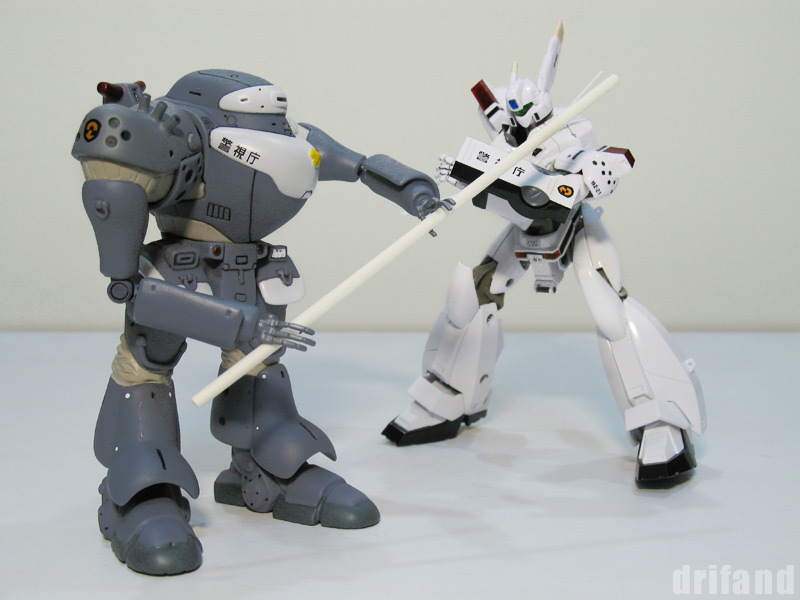 If you are hasty in transforming the SOC to either mode, you may risk paint chips on the white thighs or even breaking a plastic peg or two. One major difference between the two is that Bandai has provided optional parts to depict a refitted Irongear in the later episodes. This includes a nifty flag that attaches to the left antenna mast, a new ‘jaw piece’ and also a ‘head-wrap’ that I haven’t shown here. The Clover sports some gold trimming around the opaque deck windows, while Bandai has opted for green-tinted clear plastics. A nice touch is the SOC’s flip-top head that reveals the bridge. Taking a closer look, the contrast between old and new is really stark. The Clover’s one-color Xabungle miniature and plain empty hold was pretty much par for the course in those days; The SOC pushes the envelope with a full-color PVC Xabungle (and Walker Galliar), plus a richly detailed interior; even the hatch features slide-out access ramps. 2. A flatter decorative piece that gives the illusion of a roomy hangar (but prevents the neck from retracting). For the purpose of comparision, I have folded-up the wings. 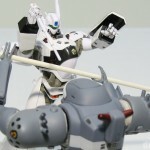 Where the Clover clumsily resorts to removable fists, Bandai has done the ship justice with properly retracting ones. In addition, the main rocket thrusters on the SOC feature opening hatches as well. Needless to say the molded details on the SOC’s nozzles clearly blow away Clover’s minimal efforts. Taking a peek below, I am reminded of the pleasant surprise I had on discovering that the Clover toy actually put in quite a bit of detail for the many hover nozzles. The best thing about the Clover toy is the inclusion of rolling metal wheels… afterall, such kiddy niceties were de rigueur. The SOC follows suit in a similar fashion, with the biggest improvement seen in the cluster of physical funnels for the mid roundel; otherwise, I feel the loss of wheels rather sharply. Another price to pay for all that hardware: you cannot expect to safely hold the SOC in one hand for actual play. It has to be supported by both hands. Sigh. This mid-transformation posture is not officially supported, but I thought it would be cool to see anyway. The transformation from Landship to Walker Machine is basically the same for both, but the SOC’s innovative use of joints means it is slightly more complicated than the Clover. On the SOC, the most fidgety part is when attaching the waist to the roundel. The fit of the parts is quite tight and I had to use more force than I expected to get them secured properly. Here’s the SOC doing its best imitation of the Clover Henkei DX! 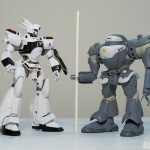 Although both toys have the same height of about 30cm, you can see that the SOC has slightly different body proportions, with the most obvious being the higher-mounted shoulders. This is where the SOC really shines. Although the high level of detailing on the SOC’s Landship mode is simply outstanding, in terms of fuss-free enjoyment, the Clover’s lightweight landship doesn’t lose out by much. In Walker Machine mode, however, the Clover is really just a brick with a pair of arms. I can’t begin to describe how impressed I am with Bandai’s ingenious solution for the tricky feat of not only separating the legs, but also designing the requisite joints to allow a truly humanoid range of motion. 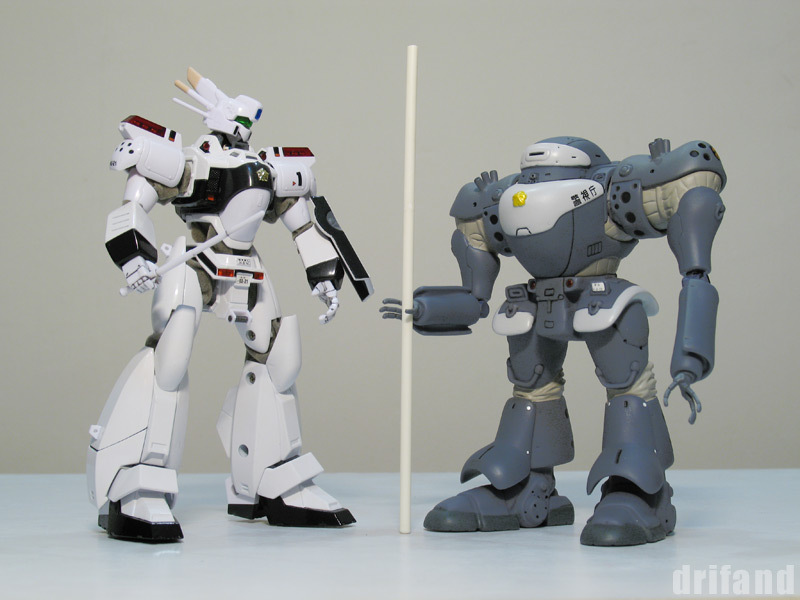 The hips may have ‘only’ 1 stop forward or backward, and the knees ‘just’ 1 stop back, BUT that is already 2 whole magnitudes of freedom over the original toy. Best of all, the joints are made of metal for durability and the toy is actually able to make use of the potential without losing its balance. And not to mention, the double-jointed elbows that allow greater than 90-degree bends. Or the ability to turn and even raise the head… a very important nuance that adds greatly to the SOC’s human-likeness. I think there are few other new or vintage robot toys in my collection that can challenge the SOC Irongear for sheer engineering brilliance. Kudos once again to the team at Bandai! 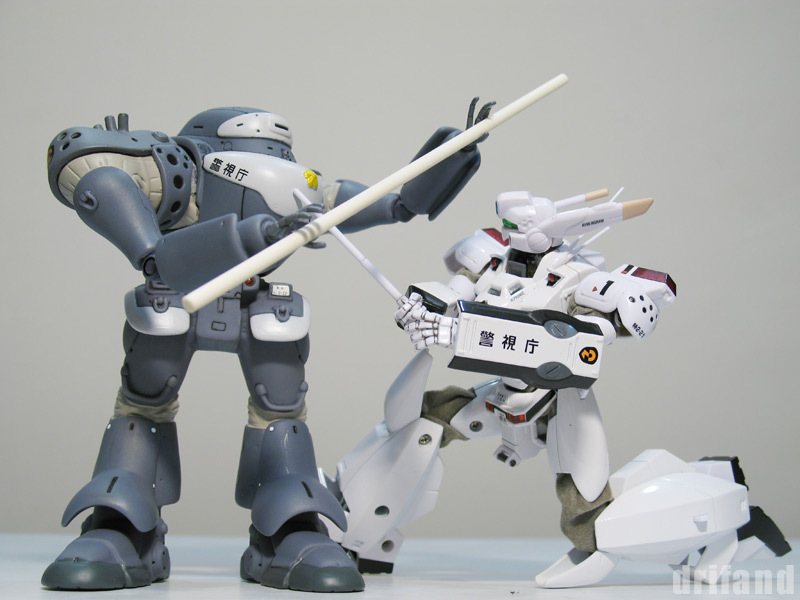 I do believe the SOC Irongear absolutely triumphs over the old stalwart that is the Clover Henkei DX. 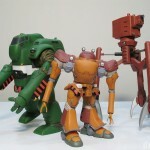 In line with bonus Walker Machines that come with each Xabungle-series SOC, Bandai has generously provided fully painted miniatures of Xabungle (in vehicular, new and damaged modes), Walker Galliar (separated vehicles, standard and bazooka poses), plus a nifty ‘Goven Class’ Buffalo Landship. More dubious, however, are the DIY ‘kits’ for 6 types of miscellaneous WMs. 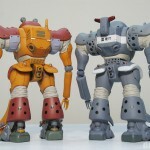 The problem is that the parts are molded in two colors only – dark gray and light tan, which means painting is a must if you want to achieve the gorgeous ‘anime accurate’ color schemes shown in the booklet. Unless you’re commited to using the right painting brushes in a patient manner, it can degenerate into an awful mess real quick. My own attempts with Gundam Markers are at best adequate… let me tell you: making ‘orange’ by smudging yellow over red paint is not fun at all! Nevertheless, I managed to complete 8 mini WMs (there are enough parts to make 2 of each type in either gray or tan), including 2 with my own color schemes. Seeing the little gang ‘in action’ around the foot of Irongear, ‘trading cargo’ and what-not is an absolute blast. All hail the new heavyweight champion, SOC Irongear!